The New Day Auction Has Now Ended : New Day – There will always be a new tomorrow. There will always be a new dawn. A New Day. It has been a week since the New Day auction ended and some of you may have seen its media coverage. Now we are about to witness the real value of the project, whether it will successfully take root in the mind of Japanese people. Below we would like to share with you the full transcripts of the speeches made by Takashi Murakami and Ken Watanabe at the auction venue. First off, I would like to thank everyone who came here today to Christie’s New York on this early morning. I would also like to say good evening to all the people watching on video in Europe and Asia. The New Day Charity auction which we are about to begin is a relief effort for the people affected by the catastrophic earthquake and tsunami which struck Japan on a still cold afternoon this past March 11. And today, the people who live in the Tohoku region of Northern Japan carry out their lives in great confusion. The main goal of this event is to ask your generous support for the people in this region. However, at the same time, I would also like to receive ideas from you. Ideas about the true meaning of independence. Like the beginning stages of cancer, the disasters of this year have left a black stain on the recovery and economic development which Japan achieved after its defeat in World War II. They have also opened a crack in the uniquely distorted sense of national independence which developed under the mentorship of the West after the war. our government continues to avoid addressing our fundamental problems. as if they are trying to run from responsibility and conceal information. The areas most affected by these disasters are still in a state of chaos. the long-term radiation problems caused by the damaged nuclear plant. Though the Japanese are known as a quiet people, even we have begun to question the inability of our nation to address its future. Like a cancer, the disasters have made our illness worse, and the pain we have felt was so severe, we had no choice but to waken from our sleep. To summarize, what I am asking from you in response to these terrible events is not only concrete financial support but also a set of ideas. The 14 artists who joined me in donating works have provided their own recipes. By our very nature, artists are always seeking independence. And the people who love art look to it for an independent way of thought, free from social, national, and individual chains. The title of this auction is New Day. The words New Day were first used as the slogan for a website and project which I began after the disasters to encourage young Japanese artists. I wanted them to believe in a new dawn. But today, here in this room, I hope that we can enter a new phase of recovery and that this will inspire people to explore their own possibilities. I myself began planning this event after receiving such an idea. It came during the disasters in an email of support from the owner of Christie’s, Mr. Francois Pinault. This event today was only possible because of the hard work of the Christie’s staff who answered many questions and spent many hours helping us with all the arrangements. I would also like to thank Mr. Larry Gagosian who deeply involved himself in the project and provided us a space for our preview. 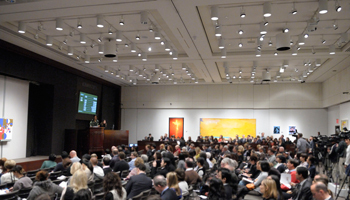 The Gagosian staff also provided us with many ideas about the dynamics of auctions and charity. Their help was deeply appreciated. And of course, there are the artists. Zeng Fanzhi, Mark Grotjahn, Damien Hirst, Thomas Houseago, KAWS, Jeff Koons, Friedrich Kunath, Mr., Yoshitomo Nara, Gabriel Orozco, Anselm Reyle, Cindy Sherman, Aya Takano, Luc Tuymans. The work which we received from all of you is the very emblem of courage. I am grateful to everyone from the bottom of my heart and would like now to say thank you. In Japan’s Edo era, we closed our gates to the outside world for 300 years. After this era ended, we then tried to protect ourselves from western empires by building a modern nation state. The Japanese people who lived in that time were thrown about like driftwood by the era’s many changes. Today, I would like to introduce you to a poem by an author of children’s stories who was born in that era. The poem is Kenji Miyazawa’s “Not Losing to the Rain”. To read this poem, I would like to introduce you to Mr. Ken Watanabe. I hope that through this poem, we can share yet another recipe for independence. And now, Mr. Ken Watanabe. First of all, I would like to take this opportunity to thank everybody who has supported Japan’s disaster relief effort. It’s almost eight months now since the quake. And with the harsh winter just around the corner, the disaster areas are still in need of your support. More than ever, it is important for us to sustain our relief efforts. Art is food that feeds the heart. It also has eased the pain. I do the same thing as an actor using dialogue. I’m always looking for the right words that will help me stay as close as possible to the victims’ hearts. The poem I am reading today is called “Ame Nimo Makezu, Not Losing to the Rain” by Kenji Miyazawa, who was born in the year of the great tsunami and passed away in the year the great quake hit the same Tohoku areas eighty years ago. He was a farmer, a scholar, and a poet. This poem quietly conveys the message that even in the most difficult of situations, people CAN overcome.